All told, there are quite a few additives that can prevent or fix problems under the hood. Our on-line advisor at eurol.com/no/tilsetningsradgiver is a reliable consultant on these additives. The additives advisor translates problems into the best solutions, associated with appropriate product advice. Har du ikke en kodenavn? Eurol celebrates the recent Dakar victory of Nasser Al-Attiyah and Mathieu Baumel with a special print on the barrels and drums. Both packaging variants will be delivered in a Dakar winners edition at the end of April 2019. Tom Coronel will participate in the 2019 TCR Europe Championship in a Honda Civic. Last season we already saw the driver in action in the Civic during the WTCR championship. Eurol supports Tom in this new adventure. As a lubricant specialist, we offer the team products and expertise. The World Touring Car Cup season is about to begin. This year Eurol supports Tom Coronel and Aurélien Panis. Both drivers will ride as team mates in a CUPRA for the Belgian Comtoyou Racing team. 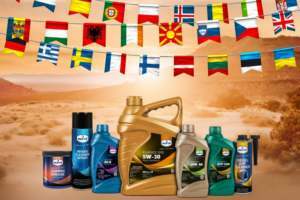 As a specialist in lubricants, Eurol offers the team products and expertise.